It’s not easy playing hockey when you can barely skate. But Frank and Chet are determined to keep Joe on the team. Even after Joe accidentally slams a slap shot straight into Jamie, a star figure skater. Jamie’s furious. Then she accuses Joe of stealing her good luck charm, a fuzzy white seal. Joe and Frank are determined to find the mascot—and the thief. If they don’t, Jamie can’t skate—and Joe’s in the penalty box for good! "Hey, Mom, Dad, guess what?" Frank Hardy burst in through the kitchen door. A big gust of wind swept in with him. It sent napkins swirling off the table his brother, Joe, was just setting for dinner. "Hey, watch it!" Joe yelled. He grabbed at the napkins. "Whoa there, tornado!" Mr. Hardy looked up from tossing the salad. "Where's the fire?" "Dad -- you'll never believe this," Frank began. Mr. Hardy held up his hand. "You don't have to yell, Frank. We're right here in the same room." "Sorry, but it's such great news." "Then don't just stand there -- tell us!" Joe yelled as loudly as Frank had. Frank grinned. 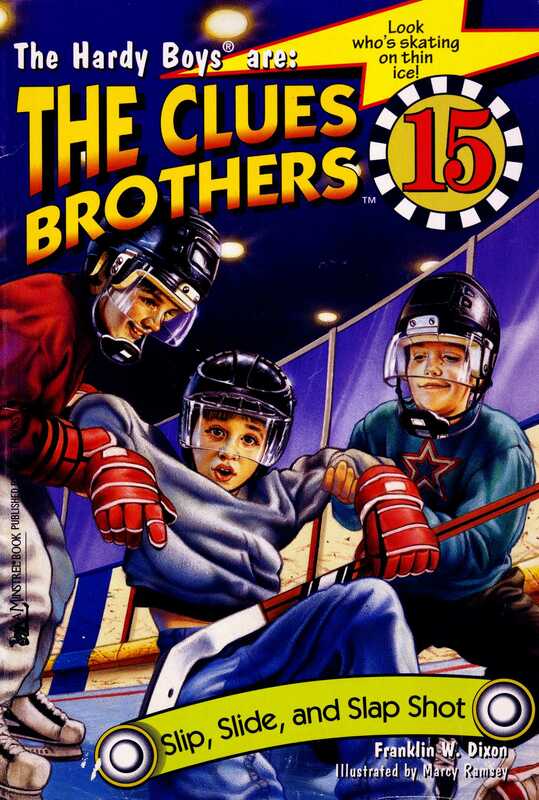 "Chet's dad is going to coach a hockey team -- real ice hockey. He used to play hockey when he was in college. So can I sign up? The first practice is tomorrow night." Mrs. Hardy looked across at her husband. "I don't see why not," she said. "I think it's a good idea," Mr. Hardy agreed. "You boys should play some kind of winter sport. I don't like it when you're stuck in the house. And hockey is fun." "Me, too?" Joe asked. "If Frank's going to play hockey, I want to also." "I don't know, Joe." Frank frowned. "Only fourth graders are on the team. It might be kind of rough for you." "Hey, I'm tough. I can take anything you can take. Right, Dad?" Joe stared Frank straight in the eye. "But you don't know how to skate," Frank said. "I do, too. Remember we went skating last winter?" "Once," Frank said. "And you spent most of the time sitting down." "I'm a quick learner," Joe said. "And you don't know how to skate any better than me." "I do so," Frank said. "I've been practicing with Chet's in-line skates. They're almost the same as ice skates." "Only not as cold when you fall down," Joe added. "I think Joe should give it a try if he wants to," Mrs. Hardy said. Mr. Hardy nodded. "I agree. Skating builds strong legs and quick reflexes." "Just the things a detective needs, right, Dad?" Joe asked. Mr. Hardy smiled. "Okay, we'll call Mr. Morton to ask him if you can join the team with Frank." "Thanks, Dad." Joe grinned at Frank. "You'd better not complain if the fourth graders are too rough for you, Joe," Frank said. "I don't complain when I play football with your friends, do I?" "Nooo...," Frank had to agree, "but ice hockey is a tough sport." "They have strict rules for hockey for younger players," Mr. Hardy said. "No contact allowed. I started playing when I was about your age." "You were a hockey player, Dad?" Frank asked. "You bet. I played all the way through high school. I wasn't bad either. I'll try to make it to some of your practices. Maybe I can give you some pointers." "Can you teach us how to do a slap shot, Dad?" Joe asked. "Sure I can," Mr. Hardy said. "I used to be known as the slap shot superman -- and try saying that five times quickly." "Slap shot superman," the boys yelled together. Then they started laughing. "This is going to be so cool!" Joe said. "Yeah, real cool. Especially when you're sitting on the ice, Joe." Frank gave his brother a friendly punch on the arm. Joe couldn't wait to go to the rink for the first practice the next day. He dreamed about hockey that night. In his dream he glided over the ice with no effort. "Joe, sit still please," Mrs. Hardy said as she drove them to their first practice. "I can't see in my rearview mirror because you keep jumping up and down." "I can't wait to get there!" Joe said. "I bet I'm going to be a hockey whiz." "Some whiz. You couldn't even stand up last time," Frank said. Then he dodged as Joe went to punch him. "I'm driving you tonight because I have to sign you up for skate rentals," Mrs. Hardy said. "But from now on you can ride with Chet." "Yeah! We get to ride with Chet," Frank said happily. Chet was his best friend at Bayport Elementary School. When they got their rental skates Joe tried not to show that he was disappointed. The boots were old and beat up. When he put them on they felt wobbly and not very comfortable. Joe began to have second thoughts. He remembered how hard it had been to balance on skates. He remembered how hard the ice had been when he'd fallen down on it! "Come on, Joe. The other guys are already out there," Frank called from the locker room door. "Do you want me to give you a hand?" "It's okay. I can do it," Joe called back. Joe staggered out after Frank. Frank seemed to walk easily on the thin blades. The other boys were already on the ice. Joe recognized Peter and Mark and Jose from Frank's class. They were right in the middle of the rink, a long way from the barrier. They all looked as if they knew how to skate. For a second Joe thought about telling Mr. Morton he didn't want to join the team after all. But then he knew he wasn't going to quit in front of Frank and the fourth graders. Chet clomped over to them. He was munching on Cheezy Wheels, his latest favorite snack. "Hi, Joe. I didn't know you could skate," he said. "Sure I can," Joe said at the same time Frank said, "He can't." "It's been a long time since I skated." Joe glared at Frank, telling him to shut up. "I'll remember as soon as I get out on the ice." "Chet, I thought I said no snacks at the rink!" Mr. Morton called from the ice. "Go throw them away right now. We don't want crumbs on the ice. They might make someone trip." Chet made a face. "I haven't finished my Cheezy Wheels. How am I going to skate with no energy?" he muttered to Frank and Joe. Frank grinned at Joe. "When it comes to food or skating, Chet will always choose food," he said. "Come on, Joe. Let's get out there. Do you want a hand?" "I can manage," Joe said. "You don't have to treat me like a little kid." "Okay, suit yourself," Frank said. He stepped onto the ice and skated out to the other boys. Chet followed him. Joe took a deep breath and stepped onto the ice. "Ready or not, here I come!" he yelled. Joe tried to skate like the hockey players he'd seen on TV, but suddenly his legs were going in different directions. He couldn't control them at all. His ankles were wobbling like crazy. "Whoa!" he yelled. He came flying into the group of boys and grabbed onto Frank to stop himself. "What's this kid doing here?" a tall boy with buzzed blond hair asked. "He's my brother," Frank answered. "We don't want little kids on the team," the boy snapped. "And he can't even skate." "My dad said he can be on the team, Darren," Chet said, moving over close to Joe. "And my dad's the coach." "We're going to lose all our games if we have a team full of wimpy little kids," Darren growled. "I'm not a wimp," Joe said at the same time as Frank said, "He's not a wimp." "If you don't like it, go play on another team, Darren," Chet said. "I've been skating at this rink since I was three," Darren said. "I'm staying, but that kid better not get in my way." He skated away really fast and sent up a shower of ice when he stopped. Joe wished he could do that. "Don't mind him," Chet said. "He thinks he's so hot. You'll be fine, Joe." "I will be when I can make my feet obey me," Joe said. "You'll get the hang of it," Chet said. "Come on, Frank. Take his arm. We'll skate him around a bit." Joe linked arms with Chet and Frank. They started to skate with Joe in the middle. Slowly Joe got the feel of pushing forward with one skate, then the other. "See? You're doing better already," Chet said. "Now try it on your own." He gave Joe a push. Joe felt himself gliding over the ice. "Hey, I'm doing it!" he yelled. Just then someone came shooting past him like a mini tornado. Joe only had a second to realize that the skater was Chet's little sister, Lola. The next second he had lost his balance. "Whoa!" Joe yelled. His feet went flying and bam -- he sat down hard on the cold ice. He looked up when he heard giggles. Two girls were standing on the other side of the barrier, watching him. They were dressed in matching red skating outfits and white tights. They had matching ponytails, only one was blond and one was brunette. With a sinking feeling, Joe recognized one of the girls. Over her red outfit, the brown-haired girl was wearing a white fake fur jacket with a hood. She had white skating boots slung over her shoulder. She was Melissa Jonas from his third-grade class. At school she was always a pain and a snob. Now Melissa leaned over and whispered to the girl beside her. Joe tried to get to his feet, but his feet kept slipping away from him. The girls were still laughing. The blond girl was laughing really loud. "Boy, what a loser," she said. Her voice echoed across the ice. "That guy looks like his legs are made of spaghetti!" Joe closed his eyes. He wished he could sink through the ice and disappear. How was he ever going to face Melissa at school again? How was he going to show her that he wasn't a loser with spaghetti legs? Copyright &copy; 1999 by Simon and Schuster Inc.